1. 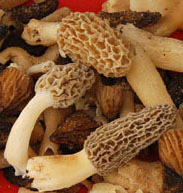 Find a mess of morels. 3. Slice the larger mushroom in half. 4. Place the mushrooms in a container of well-salted water. 5. Soak for 10 minutes. 6. Dump the water and rinse the mushrooms again. 7. Wrap the mushrooms in paper towels until ready to cook. 1. Heat a well-seasoned cast-iron frying pan on medium heat until it’s hot. 2. Pour the mushrooms into the heated pan. 3. The remaining water in the mushrooms should immediately begin to sizzle. 4. Keep turning the mushrooms into their own moisture in the pan. 5. Once the moisture begins to dissipate, add either a dab of clarified or real butter or some extra virgin olive oil. 6. Add a pinch of sea salt. 7. Stir the mushrooms into the melting butter or olive oil. 8. Keep stirring until the mushrooms just begin to look wilted. 9. Turn off the heat. 10. Remove the mushrooms from the pan.